I've dined with Ambassadors, rubbed elbows with Presidents, and conversed with Heads of State, but of all the states I've lived in, I have never been to a Governor's Mansion. As it turns out, touring The State of Georgia Governor's Mansion felt every bit as prestigious as any of those other experiences. I'd wanted to tour the Governor's Mansion for many years and am so glad I finally made it happen…and it's a free tour so that made it even more appetizing. I decided that since we have a new administration that was about to move in, I would wait until the move and then go. Turns out the Mansion is closed for the first two weeks of January, so it all worked out. 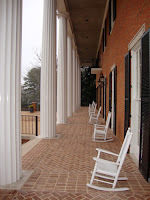 Tuesday, January 18, 2011 was the first public tour date following the inauguration of new Georgia Governor Nathan Deal and Georgia's First Lady Sandra Deal being in the home. Surely busy with matters of State, we would not have the opportunity to meet the Deals on this particular visit, but I'm told that during previous administrations, the Governor and First Lady do from time to time visit with guests when they tour the mansion. As can be expected, you have to go through security to gain entry to the Mansion grounds. Basically, you give your driver's license (or other government issued identification) to the security guard and once cleared you'll be directed to the guest parking lot, just steps away from the guard station and the Mansion's front door. The Governor's Mansion is the official home of Georgia's Governor and that person's spouse, currently Nathan and Sandra Deal, Nathan being the recently elected Governor and Sandra the First Lady of Georgia. 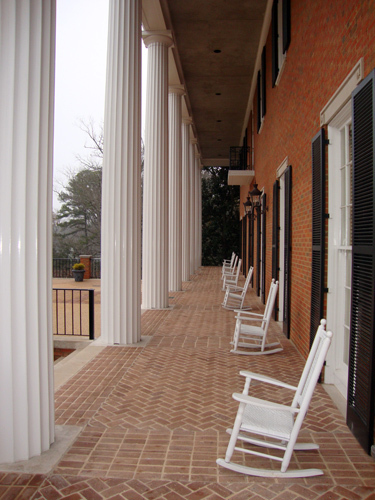 The Mansion was completed in 1967 and opened officially on January 1, 1968…not that long ago considering it's now the home of Georgia's 82nd Governor. Although relatively recently built, its design is neo-classical, meant to reflect Grecian design, Greece being the birthplace of democracy (even though we're a Republic, we employ the democratic process of voting for our leaders). 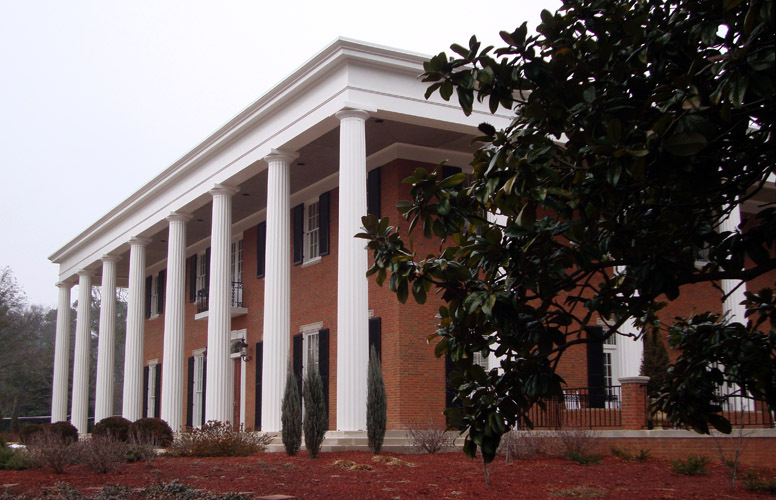 Surrounded by 30 Doric columns (think "Parthenon" in Athens, Greece), each at 24 feet tall, the Governor's Mansion is a 30-room, 24,000 square feet stately manor situated on approximately 18 acres. Tours of the Mansion are a hybrid of self and guided. 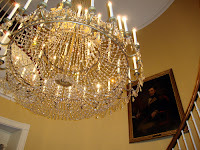 Unlike other tours I've been on, you can move about the house at your own pace and for as long as you like (first floor only, the Deal's private space is on the second floor) and there are docents in each room to give tailored discussions based on specific interests. When I arrived at the front door, I didn't know whether to ring the doorbell or go right in…it is someone's home after all. After peeking through the sidelite and noticing activity, I went on in. I was immediately and enthusiastically greeted by Mary-Laine. I didn't confirm the spelling of her middle name, my bad, but her accent left no doubt of her Southern authenticity. Mary-Laine proceeded to tell me a little about the Mansion and how the tours work. She said that most visitors zig-zag the depth of the house so I did just that. The tour starts immediately inside the front door in the Entrance Hall. Embedded in the white marble floor and on the door knobs is the Georgia state seal. 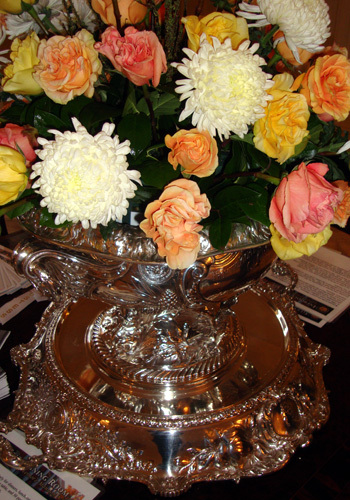 The centerpiece of the Hall is a sterling silver bowl (now used as a flower vessel) that was once on the USS Georgia and it also bears the Georgia state seal. Also in the Entrance Hall are bronze busts of George Washington and Benjamin Franklin. The first room I visited was the Guest Bedroom, the one bedroom on the first floor of a total eight bedrooms in the Mansion. Some of the prestigious guests who have slept in the Guest Bedroom include President Clinton, Princess Anne, and Prince Charles. 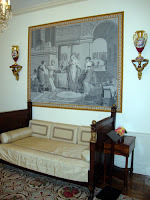 Several of the docents mentioned the needlepoint hanging in the Guest Bedroom. The largest needlepoint I've ever seen at several feet tall, it depicts George Washington. Immediately across the hall is the Library. Filled with books by Georgian authors, the collection includes books written by some of Georgia's former governors. The Library docent pointed out a favorite of kid visitors—a lamp with a bent finial. The finial was bent when a hurricane in the 1990s hit the area…and of course the lamp wasn't replaced given its historical significance. There are fireplaces throughout the Mansion. The white marble fireplace in the Library is one of my favorites. The largest room on the tour is the State Drawing Room, used for entertaining guests at the Mansion. One of the modern pieces in the home is a glass art Magnolia blossom created by Frabel, a German-born, Georgia-based artist. Although some think that Georgia's state flower is the Magnolia blossom, it's actually the Cherokee Rose (which you may have learned when you were in the Guest Bedroom). 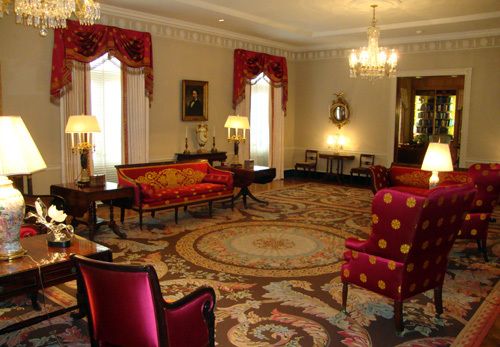 The rug in the State Drawing Room is an exact replica of the original rug in the room. It was reproduced by a local Georgia mill. One of the two prominent portraits in the room is of Lillian Henderson, the first woman to hold a prominent position in Georgia government. The docent (I was with Mary-Laine again) explained that convex mirrors (present in the room) were more popular at the time Georgia was founded because the technology to make flat mirrors (from blown glass) was incredibly expensive and difficult. Across the hall is the State Dining Room. Guarding the dining room table are two Cabbage Patch Kids fashioned after Governor and Mrs. Deal, one at each end of the table…evidently gifts from the Cleveland, Georgia company of the same name. The dining table, expanded to seat 14 (and up to 18) and collapsible to fit four, also is adorned with more sterling silver pieces from the USS Georgia. 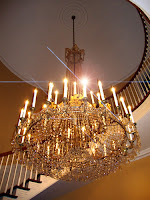 The Circular Hall is by far my favorite room in the Mansion. 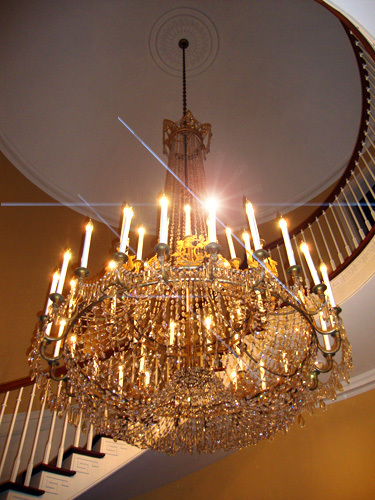 The gleam of its grandeur is visible from practically every room on the first floor. 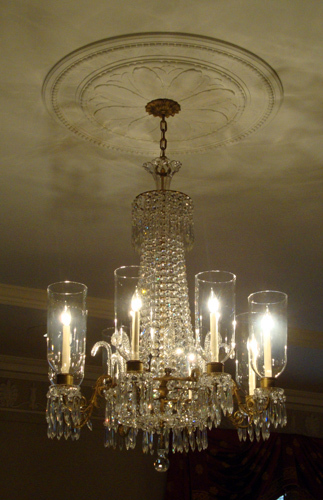 The centerpiece is the chandelier created for the Mansion from two chandeliers, one a modern American chandelier and the other a 19th Century Italian chandelier. Overlooking the chandelier is a portrait of Atlanta's first historian, Hugh McCall. If it's possible to use the term "comic relief" in the same sentence as George Washington, our nation's father…well, suffice it to say that the portrait of the first American President hanging in the Circular Hall is not exactly to scale. Presumably, the body was painted first and George's head incorporated later. One of the most rare pieces in the Mansion's collection is in the Circular Hall…it's an 1800 gold gilt vase with a portrait of Benjamin Franklin. The vase sits on a "petticoat" table. There's a mirror in the back of the lower part of the table where women could check to ensure that their petticoats were not showing, especially when receiving guests. 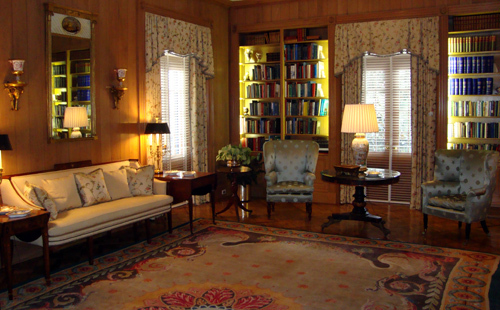 The Family Sitting Room is the most uniquely decorated room in the Mansion…immediately obvious by its butternut paneling. "Butternut" is a type of hickory…who knew?! 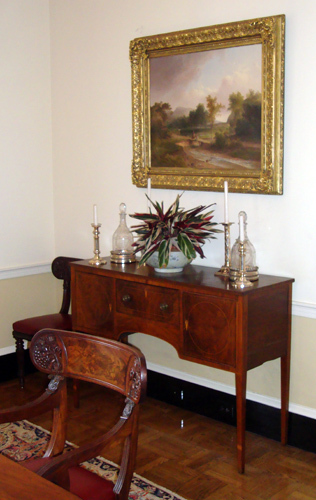 A few unique items in the Family Sitting Room include an 1820 sewing table, a writing desk owned by Amos Lawrence (a merchant and philanthropist), and a sofa that was inexplicably cut in half and reassembled. 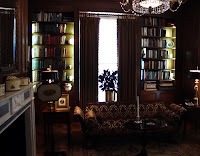 The Library's collection continues in the Family Sitting Room with books about the 159 counties in the state of Georgia. And actually, Georgia has the second highest number of counties in the United States. The Family Dining Room is where the Deal's will be having many of their meals. The table and chairs were owned by Jim Williams, of Savannah, who sold them to help pay for his trial, on which the movie Midnight in the Garden of Good and Evil was based. Really cool, under the rug that the table sits on, there's a button that the Governor can press with his foot to summon the kitchen. That's kind of cool for convincing guests that the kitchen staff can anticipate the needs and wants of the Governor, right? I wish I had a button. From the Family Dining Room you can see the Kitchen, which recently underwent a remodel and modernization. The room docent told me that Chef Holly had stepped out to do a little grocery shopping. While standing there, Holly returned, with groceries, so I got a glimpse of her and some of what the Deal’s would be having for dinner, I assumed. You too can sample Holly's culinary creations! Holly posts a "recipe of the month" on the Mansion's website. While there's no gift shop in the Governor's Mansion, I was able to pick up an official Governor's Mansion tree ornament, which will go quite nicely with my White House ornaments. 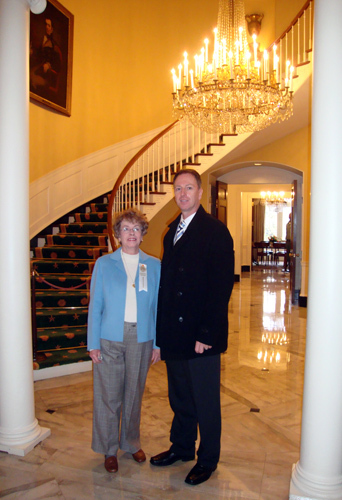 The absolutely most impressive part of touring the Governor's Mansion was the volunteers. "Volunteer" meaning that they're not paid, that they give their time to the Governor's family, the people of Georgia, and all visitors to the Mansion. When I finished my tour, it was close to 11:30, the close of tour time at the Mansion. Several of the volunteers made a little extra time to chat with me on the way out. 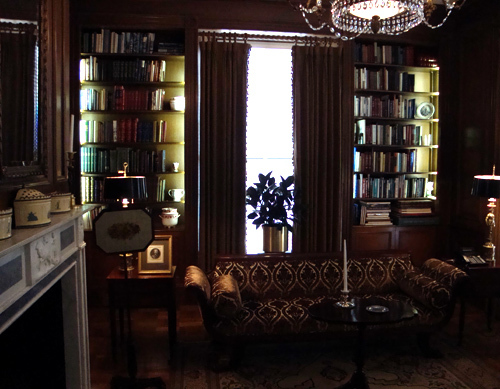 They asked about my writing and they told me more about the Mansion…a great way to finish a tour. They made me feel like a VIP guest and I appreciate their gift of time and enthusiasm for one of our city's more remarkable tourist destinations. Will I vote for a return visit to the Governor’s Mansion? That would be a great big giant check mark in the "yes" box. 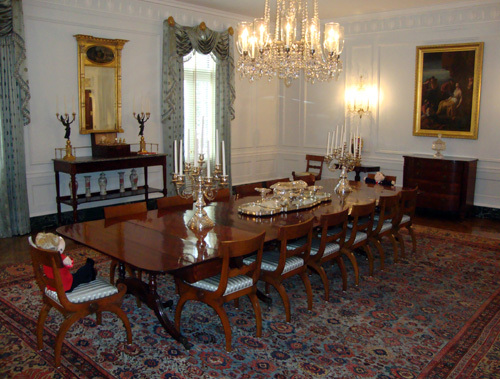 Several of the docents recommended returning when the Mansion is decorated for Christmas, so that's on my calendar. I've always wondered how to get a tour. Your post makes me want to have a look.